Experienced professionals for house cleaning Los Angeles will show up on time at your doorstep. Everything was wonderful, we were very impressed. The cleaner was on-time, professional and left my place spotless! The girls showed up on time at my doorstep. My house is clean now all the time. It’s a real life saver! I am happy. I have used other housekeepers and this service has something special. By far the best home cleaning I’ve ever had! 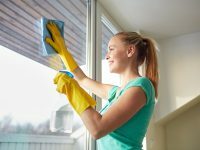 How to clean your house: Half of the work to clean your house is tidying and organizing and it’s actually a lot harder to clean a space when its cluttered and disorganized. You may want to put on some music on or an audio book before you begin. House Cleaning Services: The first step to clean your house is walk around the house and grab everything that needs to be washed using a basket or hamper. These include; clothes in the bedrooms, floor mats, blankets, the dog blanket etc. Throw these into the laundry machine while you do the rest of your cleaning. Move items that are likely to get in your way and store them away until you are ready to put them back again. Remove the pillows from the couch and set those aside somewhere else in the house where they aren’t in your way. Also, move things like old magazines and newspapers and store them away. Move shoes to the shoe rack and any clothes that may be hanging around to the laundry. Also, make sure there are items are stored where they belong you start cleaning. House Cleaning Los Angeles: The next step to clean your house is to clean the kitchen. For this you will need a granite cleaner. The reason for this is because vinegar should not be used on granite. Remove all the items from the counter top and wipe everything down including the appliances. If there is anything caked on the counter tops, use the scraper. In the process of cleaning the kitchen, remove and put away any kitchen appliances that you don’t need on a daily basis so they don’t clutter the counter top. Turn on the oven self clean and for the microwave, clean the outside using the all purpose cleaner. For the inside, pour vinegar into a half a bowl and put it in the microwave for about a minute and thirty seconds. This will loosen up all the dirt inside the microwave so that it becomes easy to wipe it off with the micro fiber cloth. Wipe the fridge as well. Take the trash out and wash the trash can. Leave it upside down outside for it to dry. For this, you will need antibacterial cleaner, a microfiber cloth, a mop and toilet brush. Spray the toilet bowl with antibacterial cleaner and then all surfaces in the bathroom with the antibacterial cleaner. Next, wipe down all surfaces using a micro fiber cloth starting from the top downwards. Leave the toilet for last. Scrub the toilet bowl with the toilet brush and flush the toilet while holding the brush down to rinse it. Give the brush a good whip to get rid of excess water and return it to its container. Mop the floor moving towards the door. Bathroom cleaning is important for house cleaning Los Angeles. Take some baking soda and sprinkle over the entire couch. This is a quick and easy couch refresh treatment that will deodorize the couch. Let that sit while you do the rest of your cleaning. For this next step to clean your house, you need an all purpose cleaner. You can get one from your local store. Take a micro fiber cloth and spray cleaner generously just to make it sufficiently damp but not dripping wet. Go through the entire living room wiping everything including the remotes, the TV and anything that can be wiped. Move in a clockwise manner methodically around every room to make sure you have wiped everything. Leave the glass and mirrors for last; don’t forget the sliding doors if you have those. Remove everything from the dining table and wipe it down. Keep spraying some cleaner on your micro fiber cloth as needed. Put everything back in the dining table and living room once you are done. Next, move to the bedrooms one by one and wipe everything in the same manner. Vacuum the couch to remove the baking soda and then all floors in the entire house with the exception of the bathrooms. If you have tile floor, wood floor or marble floor, mop the floor by using the proper chemical. • You can make you own all purpose cleaner. To do so, you need a spray bottle, one part distilled white vinegar, two parts water and 15 drops of tea tree oil. This is good for house cleaning Los Angeles.